February 2009 ~ I Can Do That! People love to "Frenchify" everything to sound sophisticated, for example, haricots verts when they can simply say green beans. Recently the word cremeux has been popping up in restaurant menus and blogs. One recipe I saw was Chocolat Cremeux and when I read the recipe it is simply chocolate pudding and nothing else, extra creamy perhaps, but it is just good old pudding. Reading the recipe made me crave for chocolate crem...er..pudding. The chocolate pudding I prepared does not have egg yolks and is sort of healthier because it has cactus honey powder which is supposed to have less calories and carbs, and low glycemic index, but I am not 100 percent sure about its healthy claim. This pudding also has plain soymilk which does not alter its deep chocolate flavor nor its creamy consistency. Preparing the pudding is very easy and the snack is ready to enjoy in less than 2 hours. In a medium saucepan, mix the cactus powder, cocoa powder, salt, and cornstarch with a wire whisk. Gradually add ½ cup of the milk, whisking constantly until smooth and lump-free. Add the rest of the milk and the soymilk and mix well. Turn heat on to medium high, bring mixture to a boil while whisking. Lower heat to medium and cook until the mixture has thickened, about 5 to 8 minutes, stirring and scraping the bottom of the pan with a heat-proof spatula. Turn heat off and stir in vanilla extract. Divide pudding into 4 glass or clear plastic containers and chill in the refrigerator for at least 1 hour. Garnish each with ½ teaspoon shaved chocolate before serving. One of the stuff I asked the husband to bring from his recent visit to the Philippines is coffee beans that have been eaten and excreted whole by civets called alamid. I have read about these coffee beans in many blogs and have wanted to try them. Espresso: bold, rich, fully developed flavors swirling around your upper and lower tongue, no negative aftertaste. I ground the coffee beans in a clean unused grinder and brewed it in my stovetop espresso maker, drank it black with no sugar. I agree to the sweet rich flavor and non-acidic clean aftertaste but can't really say it has chocolate flavor. I didn't add milk macchiato-style which might explain the non-chocolate taste. The whole bean itself has a very fragrant chocolate aroma. What I like is the lingering cool mouth feel around and under my tongue similar to the essence of mint but without the minty flavor, I'm sorry if I can't explain it very well, you'll just have to try it. It will cost you though as the coffee is expensive at $110 per pound (P1100 for a 100-gram jar) and if I were a billionaire and have lots of cash to burn I will drink this coffee everyday for the rest of my days. Here is the Coffee Alamid website. I miss the voice of magtataho summoning kids and adults alike to his taho, the custard-like shaven silken tofu with brown sugar syrup and chewy sago pearls. In the Philippines taho is eaten as breakfast, snack, or dessert. I remember my son, armed with a large glass tumbler, used to wait for the lilting voice of the magtataho yelling tahooo, tahooo! Here in the US we usually have taho as a dessert in Chinese dimsum restaurants where it is served with warm ginger flavored white syrup. Very yummy too. It is easy to prepare taho at home. Get the softest silken tofu available, I prefer the ones in tubes from the Korean grocery. Cook large-size Philippine tapioca pearls (sago), then boil equal amounts of brown sugar and water for 10 minutes. Shave the tofu using a spoon into a tumbler, add sago, pour the still warm syrup and enjoy taho any time of the day. To cook sago: In a medium saucepan, heat 4 cups of water, bring to a rapid boil. Add ½ cup uncooked sago pearls, lower heat to medium-high and boil uncovered until the middle portion of the sago is almost clear. Drain and transfer into a bowl with cool water. The sago will turn transparent all throughout in a few minutes, they will be chewy just the way I like them. To cook ginger-flavored syrup: Boil uncovered for 15 minutes equal amounts of water and white sugar with a quarter-inch thick slice of peeled fresh ginger. We thoroughly enjoyed watching him eat sisig, bone marrow, and goat head in Pampanga. He really seemed to love most of the food specially the crispy lechon and we appreciate his keen understanding of the diverse Filipino cuisine having only tried the food in Manila, Pampanga, and Cebu. I was also touched by his genuine concern for Augusto, the young man who convinced him take a look at the Philippines. I hope he goes back to try the specialties in the North. I read in Claude Tayag's (his host in Pampanga) homepage that he gave Anthony a copy of KULINARYA: A Guidebook To Philippine Cuisine which Claude contributed to as the stylist and has a few of his recipes, one is the Fiddlehead Fern Salad with boiled quail eggs that Anthony had. Click here to read the full article he wrote for The Philippine Star on Anthony's visit to his home. I like this guidebook very much. The photos are beautiful and the recipes are easy for a new cook or someone who has never cooked Filipino food before. The recipes are unpretentious in their simplicity, no fusion or anything fancy here, the Leche Flan has canned condensed and evaporated milks, NOT fresh milk, as majority of Filipinos cook leche flan using these. The book does not have all the recipes, it is just impossible to include everything because Filipino food, as Anthony has found out, is very much diverse and varied. There are few minor mistakes but I am glad that dishes that are unappetizing to look at like dinuguan (pork blood stew) are not included in the book. KULINARYA is a good start to introduce our food to the world. The principal problem in branding and defining standards for Filipino cuisine is that Filipinos are by nature highly individualistic and diverse. Standards in our culture seem to exist not so much to be followed strictlty, as to serve as a basis of personalition. In fact, variation and diversity are the standard. The preparation and presentation of Filipino food is tremendously varied, even within the same province, town, or neighborhood, in the same way, for example, that villages separated by less than an hour's walk in the Cordillera mountains speak completely different languages and regard each other as foreigners. My daughter and I can't seem to get enough of these Cara Cara oranges also called pink navels. They look like smaller grapefruits but without the acidity. These salmon-colored oranges with bright orange rinds are so sweet, flavorful, and very very juicy, we sometimes eat them over the sink. I have never heard of them before until I saw them at Costco last week. I'm going to get these oranges until the season is over which I think is end of February. A few have been turned into orange and Meyer lemon marmalade and I candied the rinds including the white stuff. I just couldn't throw them away, they look pretty and because they are not too bitter they make excellent candied rinds. Of course I had to dip some of the candied rinds in dark chocolate. Double yum! The giant Mallorcan ensaimada featured on the PBS show SPAIN On The Road Again with Mario Batali is filled with candied spaghetti squash which in Spanish is called cabello de angel (angel's hair). The baker says he cooks the squash with sugar, honey, and lemon zest into a paste. He stretches the ensaimada dough really thin just like strudel, spreads lard all over, places the squash on one long end before rolling tightly into a log, coils into a snail shape, and lets the coil rise for 12 hours. When Mario took a bite of the ensaimada and proclaimed it was the best pastry he has ever eaten I just had to make this sweetened squash. I've cooked spaghetti squash before and I like that it does not get mushy, retains its vermicelli shape, and it stays a little bit crunchy even after it's cooked. Candied, it has a slight chestnutty flavor that is milder than kabocha. I used the light-colored candied squash as topping for Danish pastry and the second to fill the Mallorcan-style ensaimada I made a few days ago. I stretched the dough as much as I could which is not difficult to achieve resulting in an ensaimada that has a very flaky crunchy crust and the softest crumb. I agree with Mario, this ensaimada is delicious, so heavenly delicious. I love them more than the egg and butter loaded Filipino ensaimada which is closer to brioche than to Mallorcan ensaimada. In a small bowl, dissolve the yeast in 1/3 cup of the warm milk and let stand for 5 minutes. In a bowl of a stand mixer with the paddle attachment, stir together the flour, salt and sugar. Add the remaining milk, eggs, olive oil, and the yeast mixture and mix on low speed for 2 minutes. Replace paddle with dough hook and knead on medium for 4 to 5 minutes. Form the dough into a ball, place in an oiled bowl, cover with plastic film, and let rest at room temperature for 1 hour. Divide the dough into 3 equal portions. Oil a work surface, a rolling pin and 3 baking sheets. Roll out 1 portion into a 12 x 6-inch rectangle. Spread lard and fold in half lengthwise. Spread lard and fold again in half lengthwise. Roll again into a 12 x 6-inch rectangle and starting from a long side roll up into a tight 12-inch cylinder. Shape it into a snail-like coil. Repeat with the 2 remaining dough portions. Place the coils on the oiled sheets, cover with plastic film and let rise at room temperature overnight or at least 12 hours. Preheat the oven to 350°F. Bake the coils for 30 minutes, or until they are airy and golden. Remove from oven and let cool on wire racks. Dust with confectioner's sugar and cut into segments just before serving. Previous ensaimada entries are here and here. 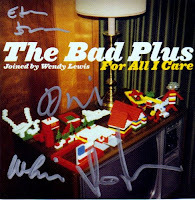 I never thought I will ever write a negative review of a music cd by my favorite jazz band the bad plus. I own almost all of their albums and I love them all. Not this new release of covers of songs by Nirvana, Stravinsky, The Flaming Lips, Heart, etc. which I absolutely hate! The songs lack imagination and they sound lifeless, uninspired, and utterly boring. It is so puzzling to me that they allowed this crap to be published, as if they have a career death wish or something. I was skeptical when I heard they will be joined by a vocalist but I am a die hard fan and bought the cd anyway. HUGE.DISAPPOINTMENT. She is awful, awful, awful. She can't sing, period!! I don't care if she is a friend of David King, the drummer, but they should have chosen someone with good pipes and style if they really want to add vocals. The reason I love them is because of the absence of vocals and I would probably have forgiven them if she has a decent voice and a singing style that suits their wild, unpredictable, and sometimes passionate interpretations of covers. Out of 12 songs only 4 tracks are okay because I get a headache when she comes on and recites, yes, she doesn't sing, she mouths or mumbles lazily the lyrics. Her emo-wannabe style doesn't fit her age and the music of The Bad Plus at all. She single-handedly ruined the whole CD but hopefully not TBP's future. I am mad as hell for all I care. Oh, well. One of the sweets I cooked for New Year's Eve was a Mexican-style fudge called leche quemada which means burnt milk. The mixture of fresh milk and sugar is cooked for more than half an hour while constantly stirring to avoid burning the bottom. I actually burnt mine a little bit which made the candies all the more yummy. Butter, candied fruits and chopped nuts are added after cooking and the candy block is chilled for 8 hours or air-dried overnight on the kitchen counter before cutting into 1-inch squares. I combined the recipes from the December 2008 issue of Saveur magazine called Jamoncillos and from gourmetsleuth using hazelnuts in place of pecans. Making the candies is labor intensive but it was well worth all the time I spent making them. These tiny candies are so delicious and super addictive. I love the hint of cinnamon and the combination of hazelnuts and pine nuts is perfect. Butter bottom and all sides of an 8-inch square baking pan, line with parchment paper, butter paper. Set aside. In a large saucepan, stir together sugar, milk, corn syrup, and salt. Add the cinnamon stick. Bring to a simmer over medium-high heat. Simmer on medium heat until the mixture thickens and a candy thermometer registers 240 degrees, stirring bottom to prevent burning. This will take about 40 to 45 minutes. Remove pan from heat. Remove and discard cinnamon stick. Add butter and vanilla, do not stir. Let mixture cool to 180 degrees. Stir mixture with wooden spoon until no longer glossy. Add fruits and nuts, stir to combine. Transfer into the prepared baking pan, smooth surface with a rubber spatula. Chill until set, about 8 hours, or leave on the counter overnight. Turn fudge out onto a cutting board and cut into sixty-four 1 inch squares. One of my dad's and now my own family's favorite dishes is steamed fish seasoned with fermented black beans (salted soy beans called tausi), sliced ginger, scallions, sesame seed oil, and salty Chinese ham. This is one Chinese dish we never get tired of and always regard as something special. I love tausi whole when adding to dishes to savor its salty goodness. Lasang Pinoy, Sunday Edition is a weekly photography meme hosted by SpiCes. Enjoy other "steamy" entries here.